A trip to Death Valley is never without stumbling across references to the Twenty Mule Team and borax mining. This trip (which was sort of a trip where we decided to go explore all the places we missed over the past couple times we've been there) we went to check out what the Twenty Mule Team was all about. There is a short road called Twenty Mule Team Road which is a one-way, single lane road through the northern end of the Black Mountains, and it goes through the Death Valley badlands area. Its an area of quickly eroding, soft mud mountains which were actually once the bottom of a seasonal lake that existed a long, long time ago (before the mountains were uplifted). Starting our hike at the old junction on Twenty Mule Team Rd. 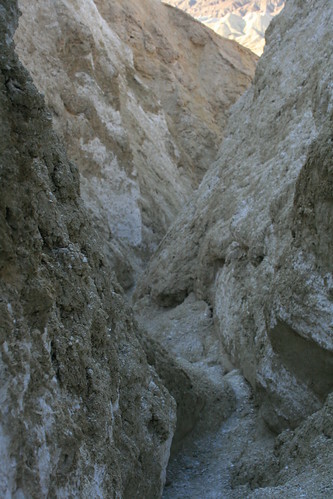 Borax found in nature is an evaporite, meaning it crystallizes after evaporation of the solute it was dissolved in, in this case, after the seasonal lake dried up (multiple times over and over again in the past). 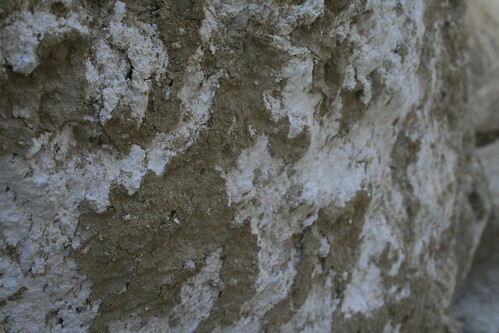 Many deposits were created like this on the muddy bottom of the ancient seasonal lake. In modern day, the ancient lake bottom has been pushed up by tectonic processes and forms the soft muddy mountains, some of which have massive borax deposits mixed in the mud. Its really a neat thing to see, because the borax looks like a bunch of bright white streaks, like powdered sugar or something was sprinkled over and within the mountain. The famous Monte Blanco, a mountain made of borax! See all the white streaks? In the late 1800s, the borax mining industry was booming, especially in the Death Valley area, although it was short-lived. 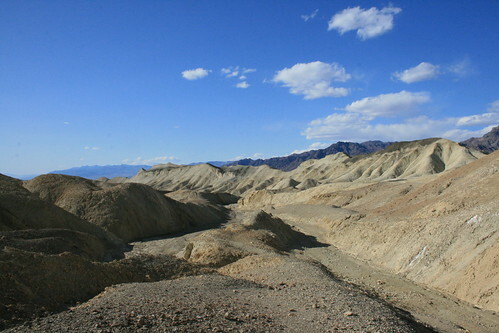 I don't think that Monte Blanco was every mined to its full potential because of the difficulty of the site, but nearby deposits in Death Valley were. The Harmony Borax Works is the most famous of the companies that mined borax there. The way they did it was kind of interesting. As we were hiking, we noticed that a lot of the borax was interspersed with the dried mud deposits, so how were they able to get just the borax out and not all of the mud with it? 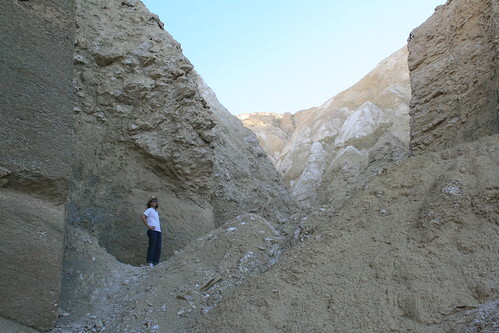 At first we thought that maybe they just found gigantic or massive deposits of pure borax, but that was not the case (although there were probably larger deposits that we never saw deeper in the mountain). A close-up of borax deposits popping out of the muddy mountains. 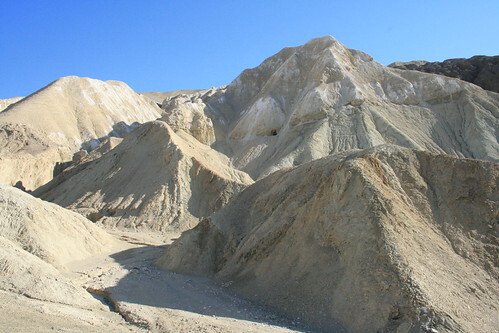 What the miners did was first dig out a bunch of the borax and mud mix, and together, they then hauled it to a processing facility near present day Furnace Creek. There they dumped it into huge pools or tanks of water where they let the borax dissolve and the dirt settle to the bottom. They did this many times to purify the water, so that only the salts and borax were dissolved in it, and not the unwanted dirt. Then they used the knowledge that borax crystallizes at a certain temperature, so they put a bunch of rods into the tanks and cooled the water down. When the water hit the correct temperature, the rods would act as surfaces which allowed borax crystal to grow on them, and this is the way they were able to extract pure borax from the water. When the Harmony Borax Works was in full swing, it employed 40 men who produced three tons of borax daily! In the heat of the summer, when the water couldn't be cooled to a low enough temperature, they moved the operation to a cooler location, near Tecopa, CA instead of Furnace Creek. Hiking up into the mud and borax narrows near Monte Blanco. I'm still not sure what all borax is good for (but you can read about it online if you're interested). I think its mainly for cleaning and buffering certain solutions. I kind of remember hearing that when borax was in its early days of mining, the miners who wanted to make a profit on it had to invent uses for it and then try to market it, because borax wasn't used much before then. While we were hiking up towards Monte Blanco, we kept getting stuck in all kinds of narrows and dead ends. As we got through the tightest narrows, we kept rubbing against the sides of the canyon walls, which crumbled at the slightest touch. In fact, if there was a section of abundant borax deposits, it was like walking through slightly compacted powdered sugar! It was so soft, literally like powder, and we got a good dusting. Our socks (we wore sandals with socks) were completely soaking it up as we hiked, and we joked that when we rinsed them out that evening, they would be super clean from all the borax. But that didn't actually happen because I don't think borax by itself is really good for laundry, its just a laundry "booster" whatever that means. We squeezed through these narrows and got covered in mud and borax dust. The mountains just crumbled at the slightest touch. Chosen for their intelligence and ability to lead the others, the first two mules in the train were aptly called the "leaders." The next 10 mules were known as the "swing team," workers that did not need special training beyond responding to commands such as "stop" and "pull." Following the swing team came the "pointers," "sixes" and "eights" — the pairs specially trained to leap over the chain when the mule train turned a corner. These mules were trained to respond to commands by name. Swinging the team around a curve in a mountain pass tested both driver and team: one mistake could spell death for all. As the team started around a sharp curve, the chain tended to be pulled into a straight line between the lead mules and the wagon. To keep the chain going around the curve and not pull the team straight over the edge, some of the mules were ordered to leap the chain and pull at an angle away from the curve. These mules — the pointers, sixes and eights — would step along sideways until the corner had been turned. Swinging a curve successfully was an awesome demonstration of training and teamwork. Finally, the "wheelers" were the last pair in the train. These mules, or sometimes draft horses, were the largest and strongest of the pack animals. Our camping spot for the evening. That evening, after hiking all afternoon around Monte Blanco, we drove up into the Greenwater Valley, which is just east of Badwater Basin. There we found a nicely graded gravel and dirt road called the Greenwater Valley road, and camping off of an offshoot road. 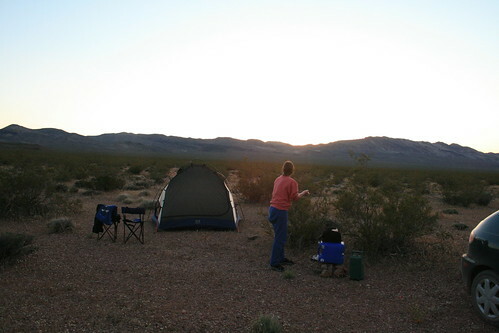 It was nice and quiet, and we found a spot between the creosote bushes. That night, we camped with the small birds and lizards, and were surrounded by some late-in-the-season wildflowers, especially the apricot globemallows.